Gary Warby, Director Premier Windows, discusses the causes of condensation on windows and helps us understand what we can do to reduce it. Seeing the world outside through misted windows can be rather annoying but condensation, or more accurately the mould that it attracts, can have far more serious consequences – condensation can be a killer. Medical research has found numerous direct links between air quality, mould, house dust mites and lung and throat diseases including asthma, with children far more vulnerable to the effects. So what causes condensation on windows? Everyday life can cause condensation from cooking, showering – even breathing. All of these release moisture or water vapour into the air. Condensation is the by-product. There is a limit to how much water vapour the air can hold. The rule is that the warmer the air, the more vapour it can accommodate, which is why on colder days, condensation is more likely to form. This will happen if moisture in the air makes contact with a cooler surface, for example outside wall or window. When this happens, the vapour in the air will become more concentrated, forming droplets – condensation. Will new energy efficient windows and doors eliminate condensation in my home? As much as we would love to say ‘yes’ they won’t – but they will reduce it. If the inside glass surface is warmer, it’s less likely to attract condensation. But this isn’t a fix in itself, it just means that the condensation is collecting somewhere else, most probably an outside wall. What can I do to reduce condensation? There are two main courses of action, one is a change in behavior, the other is making sure that rooms are adequately ventilated. This can be as simple as regularly opening windows when cooking or after showering or fitting extractor fans in kitchens and bathrooms. Windows can also be part of the solution. Trickle vents provide background ventilation, maintaining a constant low level flow of air through your property improving air quality. If you have recently noticed that your windows are misted on the inside of the glass, it means that your double-glazed unit has failed and will need to be repaired or replaced. Premier Window supplies hundreds of energy efficient PVC-U windows and doors throughout Aylesbury each year, making homes not only warmer and helthier. 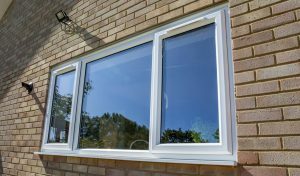 This includes an extensive range of low maintenance and energy efficient PVC-U windows. For more information email enquiries@premwindowsanddoors.co.uk or call a member of our team on 0800 854 353 .